The sticky issues surrounding natural resource development and tribal sovereignty wrapped up in the national flap over the Dakota Access Pipeline are coming to Alaska. At least they will if one group has its way. If you want to be a part of their protests in Anchorage, you better act fast. The group’s Anchorage Town Square protest is scheduled for noon today. Wells Fargo is a major investor in the Dakota Access Pipeline. We are demanding that Wells Fargo stop funding not only the Dakota Access Pipeline, but all fossil fuel extraction and infrastructure projects. 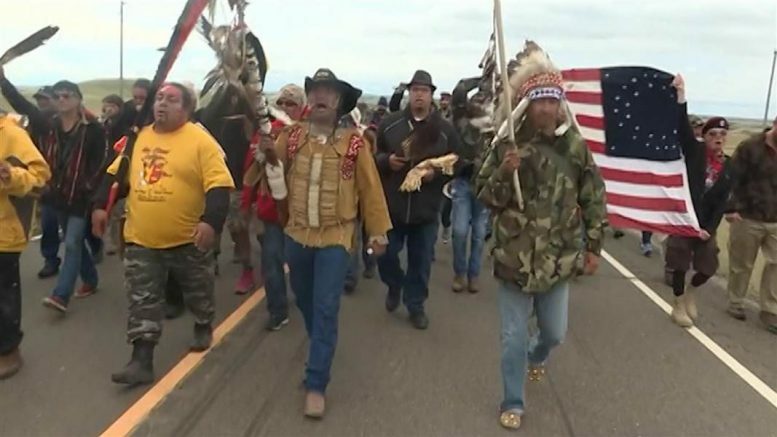 Indigenous people at Standing Rock, and throughout North America are leading the way. White supremacy, misogyny, genocide, and violent political repression are nothing new. By standing up for Indigenous rights, and standing in the way of the fossil fuel industry, we create the possibility of a future that heals the wounds of hatred, including the wounds inflicted on the Earth, the water and the climate. focused on confronting the root causes of climate change. 1 Comment on "DAPL Fight Comes To Alaska"
how wealthy do you think you want to be? the possibility of a viable future for the planet is real wealth.